The first days of September came with cold feet and grey skies, interrupted only by occasional glimpses at the sun when the cloudy carpet up there would tear apart for a moment or two. A slightly windy breeze made you feel colder than it actually was, and more or less constant rain was darkening my mood. In short: classic soup weather. This was when the cauliflower occupying too much space in the refrigerator found its destination and went straight into my stockpot, enriched by creamy melted parmesan and a few capers we had been given at a market stand that morning. As if the weather gods had generously accepted my soup as an offering, they sent us a whole afternoon of golden September sun as soon as we were sitting in front of our bowls, ready to indulge. Divide cauliflower into florets, and cook together with cubed potatoes, capers and bay leaf in a large pot with boiling water until tender, about 10-15 minutes. Remove from the heat, take out the bayleaf and purée with a hand mixer until smooth. Return pot to low heat, add ground parmesan and nutmeg, and allow to simmer for a further 10-15 minutes or so. Perhaps a little more water is needed. Adjust seasoning with salt, pepper and a dash of ground chili. Serve with a drizzle of olive oil, toasted slivered almonds (browned for a few minutes in a small pan without fat) and chopped chives on top. Die ersten Septembertage brachten kalte Füße und einen grauen Himmel mit sich, unterbrochen nur von wenigen Momenten, in denen der Wolkenteppich aufriss und ein paar Sonnenstrahlen durchließ. Ein leichter, aber kühler Luftzug ließ mich frösteln, obwohl es eigentlich gar nicht so kalt war, und ein mehr oder weniger andauernder Regen verdüsterte meine Stimmung. Kurz gesagt: Suppenwetter. Das war der Augenblick, in dem der Blumenkohl, der sowieso zuviel Platz im Kühlschrank besetzte, hinein in den Suppentopf wanderte, abgeschmeckt mit Parmesan und ein paar der Kapern, die wir am Morgen auf dem Markt geschenkt bekommen hatten. Und als ob die Wettergötter meine Mahlzeit als Opfergabe verstanden hätten, kam, als wir vor unseren Tellern saßen, für einen ganzen Nachmittag die Sonne heraus. Blumenkohlröschen mit Kartoffeln, Kapern und Lorbeerblatt in einem großen Topf mit kochendem Wasser garen, bis sie weich sind. Dann den Topf vom Herd nehmen, Lorbeerblatt entfernen und Suppe pürieren. Bei niedriger Hitze Parmesan und Muskatnuss einrühren und weitere ca. 15 Minuten köcheln lassen. Eventuell noch etwas Wasser zugeben. Mit Salz, Pfeffer und Chili abschmecken. Mit Schnittlauch, gerösteten Mandelblättchen und ein bißchen Olivenöl servieren. Soup weather will soon be here in Northern California…I’ll save this recipe until then. Delicious dreams. Yummy! Makes me want a bowl! Thanks, Lori! So glad you lie the recipe! Beautifully written. And a lovely sounding recipe too! I love cauliflower but it does take up too much room in the fridge! I have one hogging half a shelf now…I think it’s destined to become your soup! I´d be so happy if you tried the recipe, Selma! Thank you for your lovely comment! I made a similar soup using broccoli several times this winter. It’s getting too warm for soup now though, down here in Australia. I’ll have to bookmark this one for next winter. I´m sure it´s delicious with broccoli, I´ll try this! Sounds and looks fantastic, Sabine! 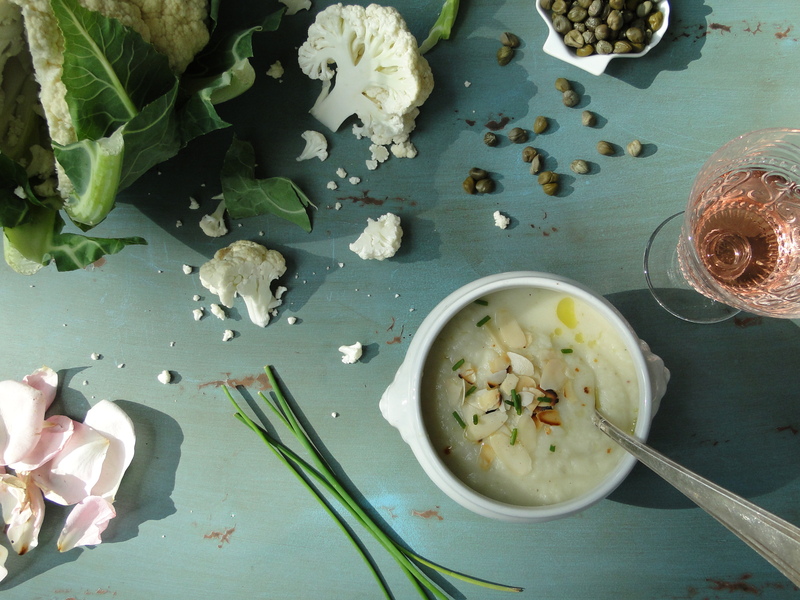 I love cauliflower soup and the addition of capers is such an original and great idea! The photos are lovely as always and yes, I’m sure that when the gods smelled your wondeful soup, they couldn’t help it but giving you a touch of light to thank you. Good evening Francesca, the capers hopped into the stockpot quite spontaneously, as I hadn´t planned on buying them at all (they were a little present given to us at a market stand).They´re not to everybody´s taste, I know, but I´m always looking for ways to include them anyway, because in small doses I find them amazingly delicate! Ici, en France, c’est encore l’été indien, il fait beau et chaud mais ta recette me pareil parfait pour les mois à venir, parce que le froid ne va pas tarder à venir ! Très belle photos ! Je voudrais bien avoir un peu d´été indien ici, mais quand je regarde le ciel, il est plutôt gris , malheureusement! Mais j´espère que le soleil revienne , le mois de septembre normalement est le plus beau de toute l´année, je trouve!